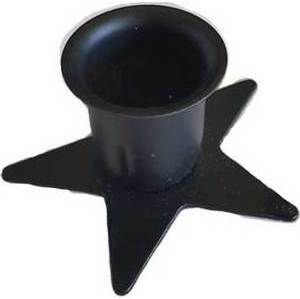 Crafted in the image of the pentagram or five pointed star; this tasteful black metal taper holder is sure to accommodate any decor. The color black is associated with protection, defense, and dispelling negative energy. It converges with the protective powers of the pentagram, a symbol utilized by many different religions throughout the ages, to create this taper candle holder.